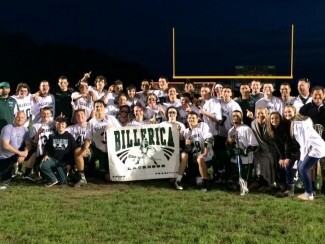 BILLERICA – It wasn’t Billerica’s night until it was. Down two after being dominated in the first quarter, the Indians turned up the wick and came back to beat Andover, 10-7, and clinch the Merrimack Valley Conference title. The Indians outscored the Warriors 5-1 in the second half. When the Indians (17-3) needed a kick in the rear, Jeff Trainor was there to provide it. The junior led all scorers with five goals, but it was his timeliness that was key. Down 3-1 after the first, Trainor scored 51 seconds into the second to ignite a three-goal run. With the game tied at six midway through the third quarter Trainor netted a pair in a 2:26 span to put the Indians ahead for good. Drew Laundry had a pair of goals for the Indians, and Dean Brooks had a goal and an assist. While Trainor was the engine that powered the offense it was Billerica’s defense that lubricated the entire machine. After Andover (11-6) scored with four seconds left in the first half to take a 6-5 lead, the Indians back six shut the Golden Warriors down. Andover outshot Billerica, 15-3, in the fourth quarter but the number of high-percentage shots were minimal thanks to a zone that the Warriors couldn’t crack. It didn’t hurt that Tyler Canto was a rock in cage with 15 saves for the Indians. Andover was in complete control for large chunks of the first half but were unable to crack through Billerica’s zone in the final 24 minutes. Jake Lakos had four goals for the Golden Warriors, and John Croston had a pair of assists. George Cardillo added two goals and an assist, including the team’s lone goal in the second half. Billerica won the ground ball battle 28-22.